Sharing a name with both a small, futuristic one-seat helicopter that appeared in two different versions in 1990, and a desert-camouflaged re-release of the Dragonfly helicopter in 2000, the Locust is the main Joe aircraft of the BTR line. 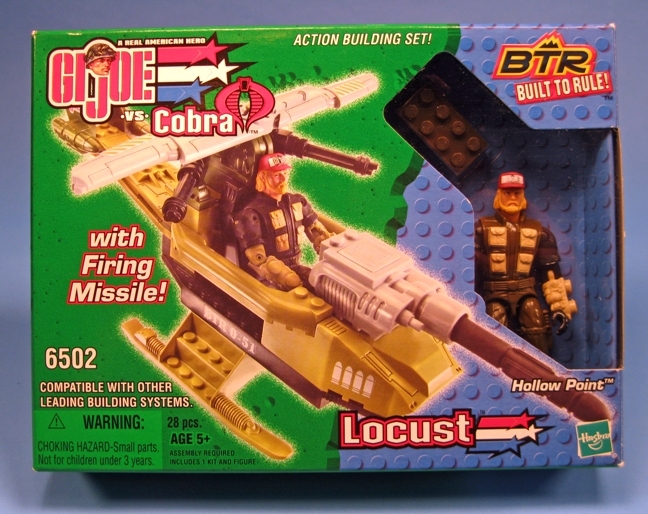 In its primary mode, the Locust is a small helicopter, resembling a Joe version of Cobra’s 1983 FANG. 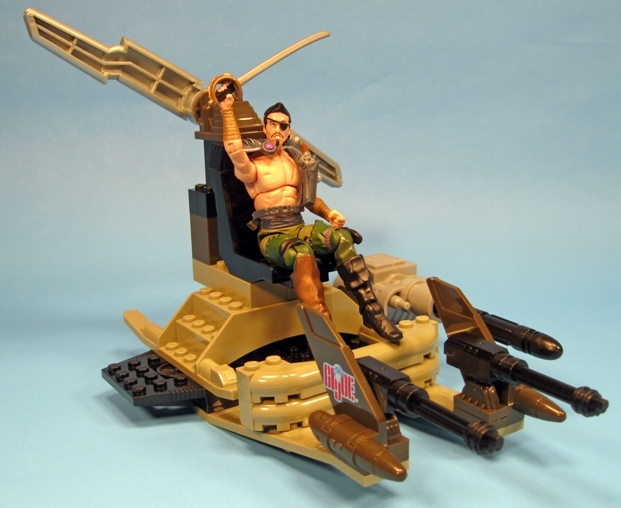 The Locust’s secondary mode, a Swamp Buggy, strongly resembles the Dreadnok Air Skiff of 1987. 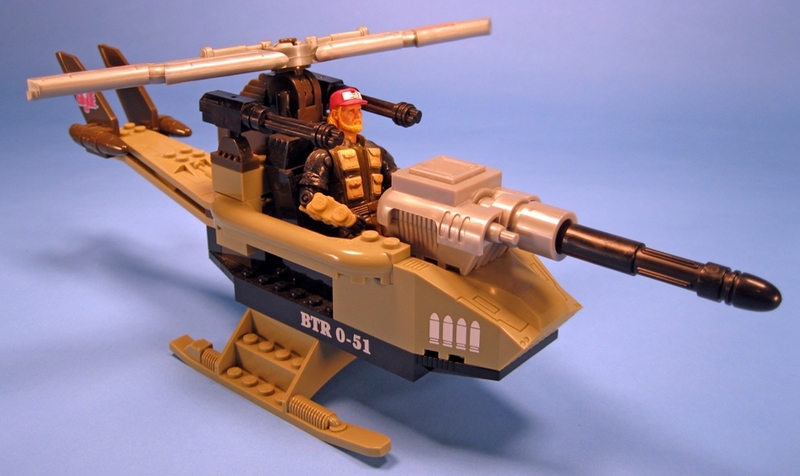 The set’s weapons include a pair of the ubiquitous BTR multi-barreled machine guns and a spring-loaded missile launcher of the basic type commonly offered in the line. 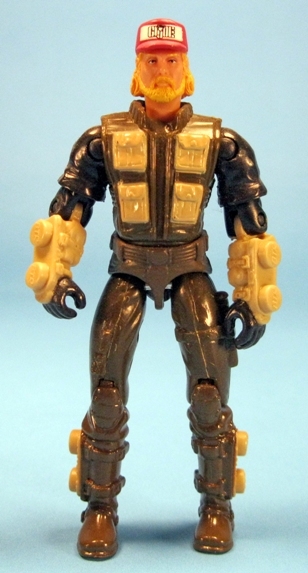 The included figure, which could easily be mistaken for Rock ‘N Roll, is the team’s Range Officer, Hollow Point. 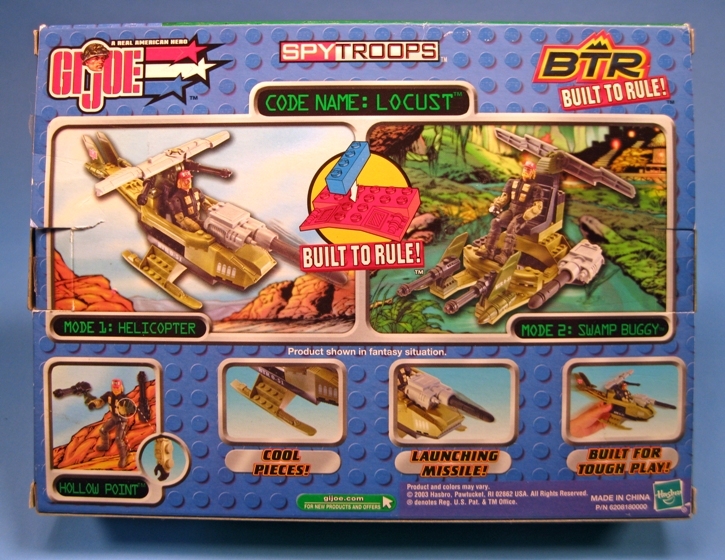 Notable parts from the Locust include the vertical stabilizers, the rotor, the skids, and the helicopter nose. It almost works as a helicopter. Its main problem is its small rotors. Until I read the packaging, I thought that dude was Rock ‘N Roll. I really don’t like the looks of the Lego pegs on the figure itself. 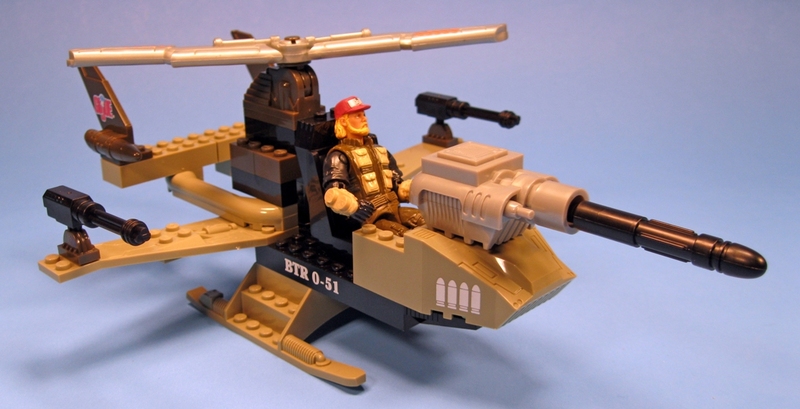 I’m pretty sure that was the only BTR set I paid full price for. I liked it a lot, but I think I got just about everything else when it clearenced out because it wasn’t moving well. I liked the concept, but I thought it was just a little overpriced so I didn’t really get behind it when it started. That said, it was a pretty neat idea and I really liked Hollow Point. He was a great figure, even with the BTR nubs on his forearms. I would only want Hollow Point, and only to give him better limbs (mainly legs and lower arms. I only got this for the unique figure and he needed major limb transplant surgery! It’s nice to see the designers paying homage to the earlier vehicles. 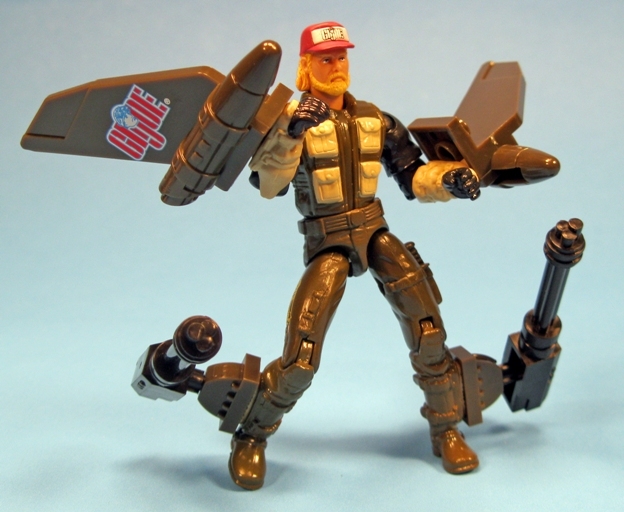 The figure is okay, although it’s clearly patterned after RNR’s then-current DDP look. My only gripes with this whole concept were giving those pegs to the figures as well. I can clearly see their function here, but the figure’s overall aesthetic really suffers without having stuff attached to it. In other news, I saw the LEGO movie in 3-D last night. Great movie, highly recommended. I have to wait a while for it to be picked up down here. I recently got a bunch of these parts, but I couldn’t do much with them. I’m a big Kre-O fan, too. 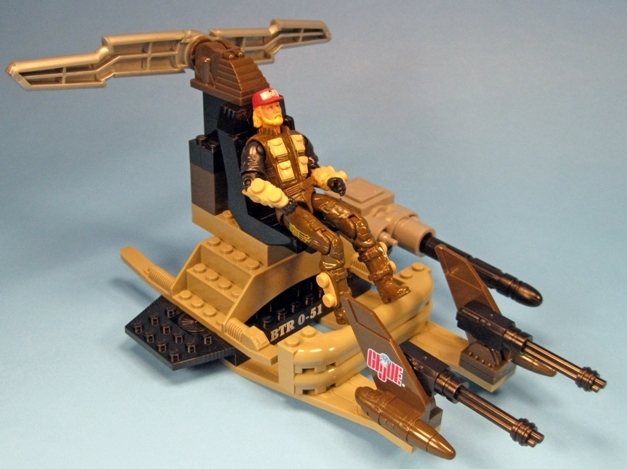 The landing skids have studs on them, but it’s one big piece, so you’re probably just going to make a small helicopter with them. The swamp buggy model here looks really forced. Hollow-point has a great face sculpt!